The monarch butterfly population overwintering in Mexico this year has hit its lowest numbers ever, according to WWF-Mexico. Monarch butterflies covered just 0.67 hectares in Mexico’s forest, a drop of 44 percent from 2012 already perilously low population. To put this in perspective the average monarch coverage from 1994-2014 was 6.39 or nearly ten times this year’s. For years conservationists feared that deforestation in Mexico would spell the end of the monarch migration, but now scientists say that agricultural and policy changes in the U.S. and Canada—including GMO crops and habitat loss—is strangling off one of the world’s great migrations. Considered one of the world’s greatest natural spectacles, millions of monarch butterflies (Danaus plexippus)—at one time likely billions—travel some 4,000 kilometers (2,500 miles) across the diverse habitats—and climate conditions—of North America, from Canada to Mexico. 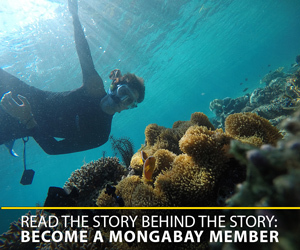 The migration is so long that no single monarch survives the whole, but instead the journey is built on generations. The butterflies, easily-recognized by even non-naturalists, depend on plentiful common milkweed (Asclepias syriaca) habitat on the way down. Monarch butterfly (Danaus plexippus). Photo courtesy of Kenneth Dwain Harrelson. But milkweed is becoming harder and harder to find. The use of herbicide-resistant crops (i.e. GMO) has led to extensive use of herbicides, which kill milkweed even on the fringes of agricultural fields. “We’re talking about hundreds of thousands of acres of land that are being sterilized, killing all nectar sources, killing all milkweed,” Lincoln Brower, research professor of biology at Sweet Briar College, told mongabay.com last year. In addition, government policies, such as the ethanol mandate, has led to vast swathes of land to be converted to monocultures, i.e. corn and soybeans. To monarchs, such fields are the equivalent of a barren desert. 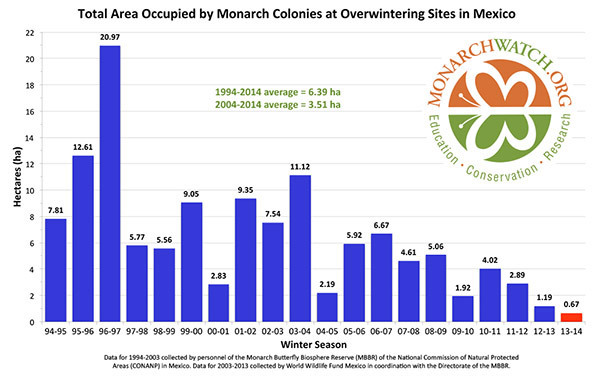 Monarch butterfly populations overwintering in Mexico as measured by hectares. Photo courtesy of Monarch Watch. Taylor estimates that monarch butterflies have lost 67.5 million hectares of habitat to both agriculture and development since 1996, an area larger than France. In fact, Oberhauser told Slate.com that essentially the use of GMO crops and the vast habitat destruction was a “smoking gun” to explain the sudden decline in the monarch butterfly migration. Extreme weather events have also taken their toll in recent years, and scientists expect this threat to only grow worse as the global climate warms further. Not all monarchs make the epic journey and the species itself is not threatened with extinction, unlike many lesser-known butterflies that have also lost out to the agricultural boom. But the journey of the monarchs, which has long fascinated scientists and lay people alike, could very quickly become an annual event lost in the past. Conservationists have begun encouraging gardeners to plant milkweeds in their garden to help stuttering monarch’s along the way, but many scientists believe larger-scale efforts will be needed to preserve the great migration. 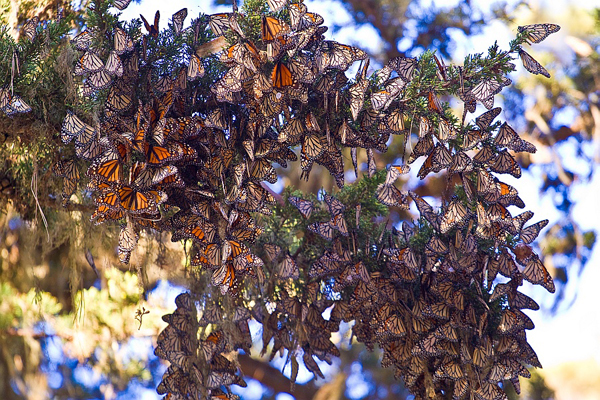 Monarch Butterflies wintering in California. Photo courtesy of Agunther. 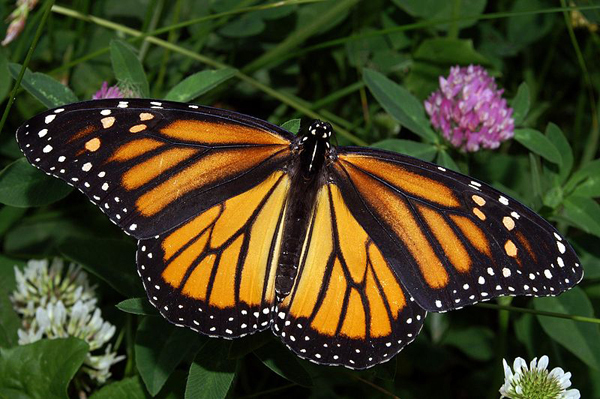 (07/15/2013) In the next few months, the beating of fragile fiery orange and black wings will transport the monarch butterfly south. But the number of monarch butterflies (Danaus plexippus) reaching their final destination has steadily declined, dropping to its lowest level in two decades last winter, according to a recent survey. (08/15/2013) In a large room that used to house aquatic mammals at the Minnesota Zoo, Erik Runquist holds up a vial and says, ‘Here are its eggs.’ I peer inside and see small specks, pale with a dot of brown at the top; they look like a single grain of cous cous or quinoa. Runquist explains that the brown on the top is the head cap of the larva, a fact that becomes more clear under a microscope when you can see the encased larva squirm. I’m looking at the eggs of a Poweshiek skipperling, a species that is more imperiled than pandas, tigers, or bluewhales. Once superabundant, only several hundred Poweshiek skipperlings may survive on Earth today and the eggs I’m looking at are the only ones in captivity. (08/01/2013) Conservationist’s faced a crushing blow last month as two butterfly species native to Florida were declared extinct. (07/31/2013) Europe’s grassland butterfly population has plummeted in the past two decades, new research published on Tuesday shows, with a near halving in the numbers of key species since 1990.